Nioh (仁王) are wrath-filled and muscular guardians of the Buddha standing today at the entrance of many Buddhist temples in East Asian Buddhism in the form of frightening wrestler-like statues.They are dharmapala manifestations of the bodhisattva Vajrapāṇi, the oldest and most powerful of the Mahayana Buddhist pantheon. According to Japanese tradition, they travelled with Gautama Buddha to protect him. The word Yokai is used in Japanese to refer to spirits and demons: a combination of "bewitching and apparition", but are not necessarily seen as evil, as some are thought bring good luck. Japanese folklore often represents these creatures as having animal features or shapeshifting abilities, and attributes them the domain of the world between life and death. Details of each Yokai are provided on their individual pages, so read those to understand each one. In Japanese, the surname comes first, then the name. Japanese commoners had no surnames until the Meji restoration, that happens after the game. Commoners in this time period would use something descriptive in the place for a surname. For example "Field worker" Or "Mountain Dweller", etc. Japanese Samurai and Aristocracy had surnames assigned to them by their ruled land or achivements. Read our Glossary to see commonly used terms in weapons, armor, etc. 石: Koku - A unit of rice (44.8 gallons/180 liters) was used to measure wealth, it is considered that one Koku may feed a grown man for an entire year. In the Nioh time period, a Samurai might earn 100 koku a year, whilst those ruling over an income of 10,000 koku obtained Daimyo status. 将軍: Shogun - Military ruler of Japan, de-facto governing although in many times appointed by the Emperor. It was originally a transient position, but it was made hereditary by the Minamoto clan in 1192, and later on the Ashikaga clan and Tokuwaka clans. The rank saw its last appointee in Tokugawa Yoshinobu who resigned from it in 1867. 幕府: Bakufu - Term used to refer to the headquarters or the government of a shogun. 忍び: Shinobi - A Ninja. A mercenary or covert ops agent for a Japanese lord. They employed "dishonorable" methods such as guerrilla warfare, espionage, and other activities that "honorable" Samurai and Warriors could not engage in. During the Sengoku period, the Iga province became famous as the "homeland of the ninja" and is the home of Hattori Hanzo. A female shinobi is called Kunoichi. 切腹: Seppuku - Harakiri, Suicide. This special type of honor death follows the "Bushido" or path of the warrior. Often practiced by the "honorable" tiers of society, such as Samurai, it allowed a combatant to die with honor rather than be captured and possibly tortured or dishonored in captivity. Outside battle, it became a way for families to attone for grievious sins such as treason without plunging the entire clan into war. Ritual seppuku had intricate formalities attached and provided an attendant that would behead the subject and end things "quickly". Seppuku is still practiced by suicidal Japanese although it is extremely rare and by no means encouraged or lauded - with famous cases in 1970 and 2003. Japanese history is divided in reigning periods, and the Japanese years are to this day counted by the years of reign of the current monarch. Japanese history officially "starts" with the end of the "Age of the Gods" and is marked by the ascencion to the throne of the direct descendant of the Sun Goddess, Emperor Jimmu in 660 BC (Before Christ). Below is a minimal timeline of some relevant events that will help players understand the historical makeup of the game. 200 AD - Empress Jingū-tennō orders the founding of what are now the oldest remaining Shinto shrines. Shinto is not a term used for a religion focused around an individual text or dogma, but rather a set of organic beliefs from different areas of Japan that worship different gods and celebrate different festivals. The practices share some common rituals such as dresscode, repetition and offerings, but have evolved over milennia. In the present, 80% of Japanese people practice Shinto without identifying as "Shintoist" because of the above differences. 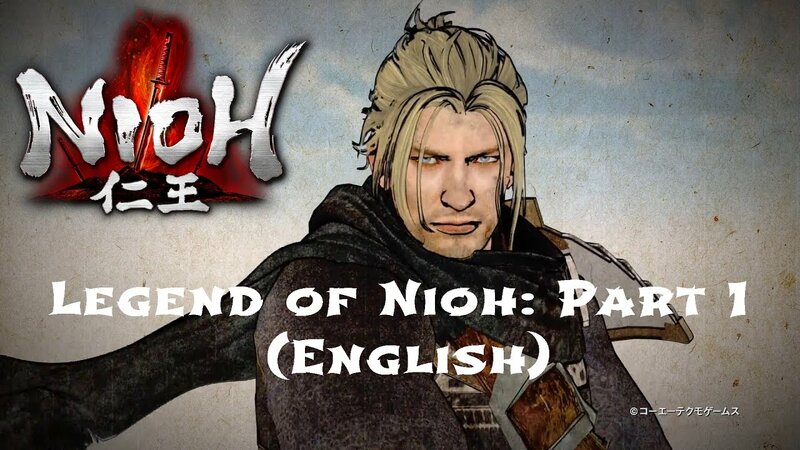 The Nioh game showcases Shinto and Buddhist lore, focusing on Japanese Mythology and Folklore. 248 AD - The Royal court settles in Nara. 538 AD - Buddhism is introduced to Japan, and begins merging into the local "Shinto"
700 AD - The Taiho code is introduced as a set of ethics and morals to the legal rule of the land. It is an adaptative document to Chinese Confucionist ideals. It introduced geopolitical divisions to the land and remained in effect with two reforms for over 1,000 years. 794 AD - Capital moves to Kyoto. 1156 AD - The Samurai class begins ascencion to power. 1274, 1281 AD - Mongols try to invade Japan twice, both times they are defeated by storms in the ocean with the few ships that make it to shore being easyly defeated. 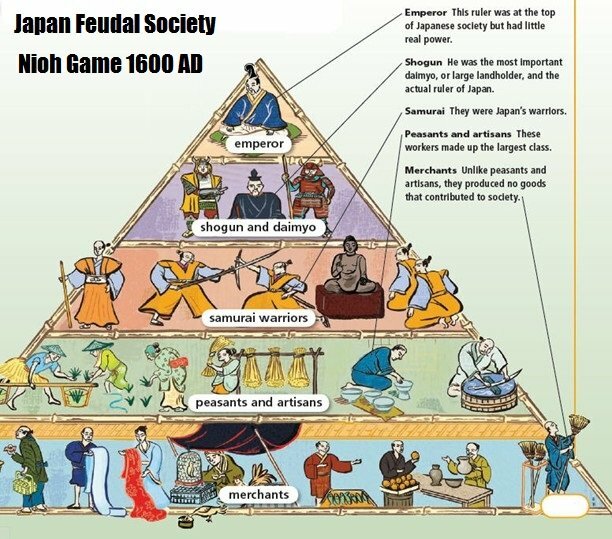 1334 AD - The Japanese royal court splits into north and south sections, creating governmental disunity for over 60 years. 1467 AD - Sengoku Period begins. Constant armed conflict, social uprising and political instability follow for 140 years. The Shinobi appear as a commonly used form of espionage. 1477 AD - Kyoto is destroyed by war and fire. 1560 AD - Oda Nobunaga begins ascencion to power in the Battle of Okehazama. 1562 AD - Hattori Hanzo rescues Tokugawa Ieyasu's daughter. He will become known as "Oni no Hanzo" or "Demon Hanzo" for his actions in battle. He is a Shinobi from Iga working for Tokugawa. 1567 AD - Nobunaga overthrows the Saito clan and takes over their castle, renaming it to Gifu (current name). 1568 AD - Ashikaga Yoshiaki asks Nobunaga for help reclaiming his stolen Shogunate in Kyoto. 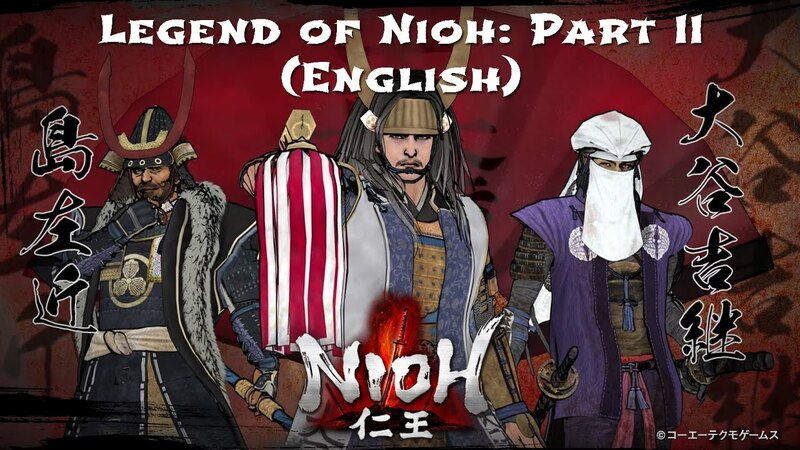 Nobunaga helps defeat the illegitimate ruler in Kyoto and place Yoshiaki in power, but quickly swaps to use the Shogunate as a front for expanding his power. 1571 AD - Nobunaga becomes famous for his mercyless tactics. He attacked an opposition's monastery near his base, the Enryaku-ji, and murdered "laymen women and children until the whole mountainside was a great slaughterhouse". An 11 year siege of an enemy castle results in tens of thousands of deaths. 1575 AD - The Battle of Nagashino sees Oda Nobunaga and ally Tokugawa Ieyasu combine forces with european firearms to succeed in a decisive battle for the period. By this point, Nobunaga had the third highest position on the Japanese courts. 1579 AD - Lady Tsukiyama is accused by Oda Nobunaga's daughter Tokuhime of conspiring with the Takeda Clan. Tokugawa Ieyasu, her husband, orders her execution. Four days after she is beheaded in Hamamatsu, their son and Ieyasu's firstborn Matsudaira Nobuyasu is ordered by Tokugawa Ieyasu to commit seppuku so that he may not pose a threat to the clan. Lady Tsukiyama is in the game as Ogress. 1582 AD - The Takeda Clan is destroyed. Nobunaga now has almost absolute military power. 1582 AD - Nobunaga orders Akechi Mitsuhide to reinforce Hashiba Hideyoshi against the Mōri clan. For reasons unknown, Mitsuhide waited until Nobunaga rested in the temple of Honnō-ji and had his men surrender it and set it ablaze. It is unknown if Nobunaga died to the flames, to battle, or by his own hand. His son was also killed nearby. His wife, "Nohime" or "Kicho" is also rumored to have been killed, but there are no records to this effect. Their marriage was political, and it is said all her sons were actually by a concubine and that she was barren. She is in the game as Yuki-Onna. 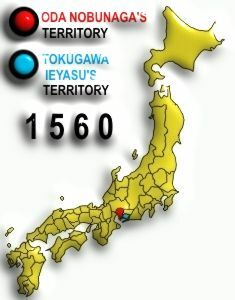 1582 AD - Hattori Hanzo successfully leads Tokugawa Ieyasu to safety through the Iga Province. 1585 AD - Toyotomi Hideyoshi launches invasions of major political lands including Shikoku, Kyushu and Kanto. His success marks the re-unification of Japan. 1590 AD - Toyotomi Hideyoshi attemps to invade Korea for several years, unsuccessfully. 1598 AD - William Adams arrives in Japan. 1598 AD - Toyotomi Hideyoshi dies, then his son dies too. 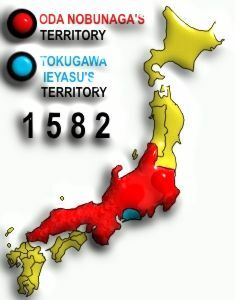 1600 AD - Tokugawa Ieyasu, the last remaining ally of deceased Nobunaga, sees the opportunity to attack Toyotomi Hideyoshi's forces and triggers a loyalty war between himself and the Ishida clan. The decisive battle was fueled by behind-the-scenes negotiating and paw trading, with promises and allegiances for betrayals forged before the real battle took place. Tokugawa emerged victorious from the now famous Battle of Sekigahara. This began the Edo (Tokyo) period of Japan. 1635 AD - A new Edict (Sakoku Edict of 1635) was issued, forbidding Japanese from leaving Japan and Europeans from entering, on pain of death. It instituted strict penalties for the practice of Catholicism and severely restricted foreign trade.